The Bean is a lowly, abused dishwasher who spends his days slaving in an ogre's inn—at least until he's kidnapped and put in the path of a legendary sword. Now the Bean has a power that could let him save his home, or rule it through violence and fear. 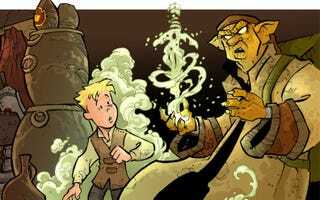 Travis Hanson's webcomic The Bean is a well-told fantasy epic from a very classic mold, one that reminds us that familiar tropes can build great stories as long as they are placed within solidly built worlds with fully realized characters. This particular tale is set in a world that sits beneath a broken moon, a place with a long history of monsters and wars. It's also a place of great transition; just a handful of generations ago, most humans dwelled underground in grand subterranean cities, and ogres were hunted for their hides. At the opening of The Bean, the few remaining ogres live alongside humans (although not always easily). One of those ogres is Gort, the owner of the Silver Dagger, an inn in Darkleaf forest. Gort employs a motley crew of largely resentful workers: Siv, a bartender who is much more than he appears; Ravna, a sharp-tongued barmaid who frequently stands up to Gort's verbal abuse; Groggle, an ogre cook with a penchant for cooking rat meat and a talent for making potions; and the Bean, a half-elven boy whom Gort treats as a slave. The Bean's life has been a pattern of small rebellions and punishments; periodically, he'll run away, only to return to the not-so-warm arms of the Silver Dagger. This routine is interrupted when, while on an errand for Gort, the Bean is kidnapped by a goblin who needs him to retrieve a sword that once belonged to a powerful and mad warrior king. But as soon as Bean comes into contact with the sword, his fate is forever altered, although it's not clear what his new fate will be. The tale of a pure-hearted boy given something dark and powerful is nothing new, but the Bean isn't Frodo Baggins, and he has to struggle against more than a mystical force that threatens to blacken his heart. As he finds himself on a bona fide quest, Bean encounters many people who have their own agendas and their own beliefs about the proper way to wield power. The Bean is an impressionable lad, and it's clear that his beliefs about right and wrong have not been fully formed—especially in a world where survival isn't always easy. But he will have to find his own way soon; an army is gathering that threatens all the peoples of the region, led by a man with a relic similar to the one Bean carries. And, in great fantasy tradition, The Bean doesn't focus solely on Bean's journey. The other employees of the Silver Dagger—some of whom go in search of Bean—have their own perils to face, as do the people Bean meets along his way. Each of these characters feels complete on the page, with their own histories and their own mysteries to uncover. Although the dialogue is sharp and the characters lively from the very beginning, The Bean is a comic that becomes richer and more interesting the further along it goes. It's clear that by the time the story reaches its climax, there will myriad competing interests and values, and that our characters will be profoundly changed—assuming they survive that long. A quick word on the artwork in The Bean, which can feel a little stark when you first jump in. It's very clear that the comic is ultimately meant to be in color, and if you look at Hanson's work on his Tumblr and deviantART gallery, you can see how lovely his linework looks accompanied by color (and good color work is worth waiting for). But even in black-and-white, Hanson's work is clear and expressive, and as things in his world grow more dire, that starkness becomes wholly appropriate to his story.